YES. The way you repel or attract relationships, the way you maintain or push away someone you love, how you feel about yourself, your motivation, your energy & zest for life and even the level of success you’ll allow yourself. What if you could uncover these hidden codes that have been running your life and neutralize them once and for all? Unlock the code to your PLATINUM life – to the secrets of Healing, True Love, Success, and Happiness. Frequency Breakthrough – Radically Transform Your Life! The Activate Enlightenment 10 Module Mastery Program has been designed to help you switch off the unconscious thoughts that contradict your greatest desires and sabotage your ability to get to the next level of joy and fulfillment. You’ve most likely experienced spiritual teachings before, but without entering the high-frequency energy field of neutrality which activates a whole new way of being. Low vibrational frequency results from having energetic blocks with emotional charges stemming from the impact of past events. Just because you feel anxious, sad, angry, frustrated or depressed doesn’t mean there’s something wrong with you. It means the time has come to experience the frequency breakthrough that will set you free from the hidden beliefs and ideas that are holding you back. Why endure a life-time of study or introspection, when we can help you achieve this transformation while participating in the Activate Enlightenment 10 Module Mastery Program, using our unique energetic shortcut! Remove your blocks to success instantly! In the UNSTOPPABLE LIFE 21 Day PLATINUM Experience you will be given the 3 keys to dissolve your unconscious obstacles to love, well-being and abundance. You will be attuned to the frequency of enlightenment and unconditional love which is the frequency of success. You will experience the process of becoming free from the unconscious programs running your life so you can have the great relationships, money, prosperity and the success you so richly deserve. Dissolve Your Blocks to Love, Well-being & Abundance! We have created an energetic antidote to the crisis of feeling overwhelmed, anxiety, and depression, which we’ll share with you, as well as the teaching of 3 simple truths to reset your life. You will also learn how to achieve more balance and harmony – instantly! …you’re invited to participate in our global “Reset Into Freedom” 3 part FREE Teleseminar series. WARNING! This is like nothing you’ve ever experienced before! 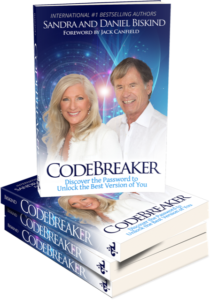 The CODEBREAKER PLATINUM MEDITATIONS for Transformation and Higher Levels of Awareness. Sandra and Daniel Biskind’s guided meditations unlock the code to your PLATINUM life – to the secrets of Healing, True Love, Success, and Happiness. This guided visualization is designed to help you raise your love vibration. All the success and love you could ever want will be yours once you open the door and accept it. This Raise Your Love Vibration guided visualization is yours absolutely FREE and without any kind of obligation. And you won’t be alone. I’ll be with you every step of the way! I’ll be with you each time you sit quietly embracing the Love that you truly are and accepting all the wonderful things you’ve ever imagined for yourself. The divinely inspired music in Dimensions Of Bliss Volume One and Two was created to attune you to the energy frequency of enlightenment. Higher consciousness means improved relationships, greater success, better health, freedom from mind chatter, addictions, cravings and the sense of separation. For more information or if you have any questions, please contact Sandra Biskind.